A group of eight CMIP5 models are used to evaluate how much of the future changes in winter precipitation can be explained by changes in frontal activity over the Southern Hemisphere (SH). The frontal activity is calculated at the 850 hPa level using the cyclonic vorticity, the horizontal gradient of temperature and the specific humidity. The changes are evaluated taking into account the historical and the RCP45 experiments. Changes in frontal activity are positive over most of the SH, being the areas with the largest increases over the mid to high latitudes. Most of these changes are driven especially by the changes in the specific humidity. The precipitation change shows a decrease at subtropical latitudes, mostly associated with a decrease in non frontal precipitation, controlled by a decrease in relative humidity and in moisture flux convergence. At mid to higher latitudes, the precipitation responds to increases in both frontal and non frontal precipitation, associated with increasing frontal activity and relative humidity and increases in the moisture flux convergence at the lower levels of the atmosphere, respectively. 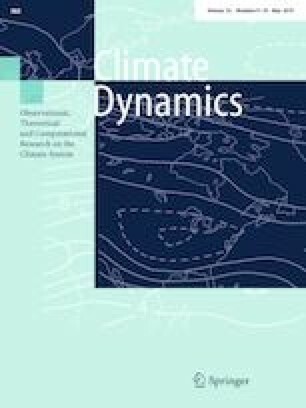 We acknowledge the World Climate Research Programme’s Working Group on Coupled Modelling, which is responsible for CMIP, and we thank the climate modelling groups (listed in Table 1 of this paper) for producing and making available their model output. For CMIP the US Department of Energy’s Program for Climate Model Diagnosis and Intercomparison provides coordinating support and led development of software infrastructure in partnership with the Global Organization for Earth System Science Portals. This work was supported by the following Grants: FONCyT-PICT-2012-1972, FONCyT-PICT-2014-2730 and UBACYT2014 Nº 20020130200233BA. The authors are grateful to two anonymous reviewers, whose comments and suggestions allowed improving the manuscript.